These units are from old leaded inventory. If you are within the EU, it is highly suggested you purchase the newer RoHS Compliant version. • Compatible to COM ports of ±5V to ±12V. • Standard DB-9 and 6-lead RJ-12 connector for easy attachment of standard 1-Wire cables and probes. • Includes DS2502 identification chip. The DS9097U is a RS-232 to 1-Wire adapter, which performs RS-232 level conversion and actively generates the 1-Wire communication signals. Together with an adequate TMEX software driver it enables an IBM-compatible PC to directly communicate with any 1-Wire device connected to the adapter's RJ-12 port. The DB-9 version reads and writes any non-EPROM 1-Wire device. All DS9097U adapters are based on the DS2480B serial 1-Wire line driver chip and therefore are not a plug-in replacement for the DS9097 or DS9097E. The RXD/TXD Polarity Select input of the DS2480B is tied to Vdd (non-inverting). The DS9097U communicates with 1-Wire devices at regular speed as well as overdrive speed. The serial port must support a data transmission rate of 9600bps. 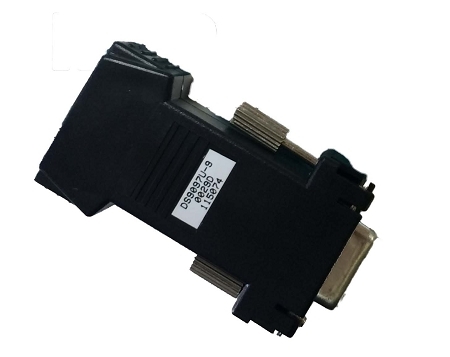 Under software control, the adapter can be set up for RS-232 data rates of 19200, 57600 and 115200bps. The two higher rates are recommended for communication at overdrive speed with overdrive capable devices. Since the DS9097U operates in a byte mode, every data byte received from the RS-232 port generates eight time slots on the 1-Wire line.